Spray 4- to 5-quart slow cooker with cooking spray. In small bowl, mix broth, 1/4 cup honey, the garlic, salt and pepper. Add potatoes and onion to slow cooker. 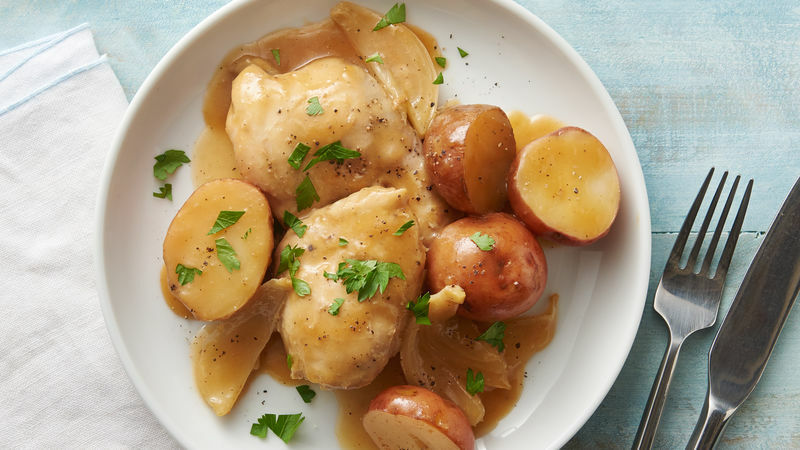 Arrange chicken on top of potato mixture in slow cooker; pour broth mixture on top of chicken and potatoes. Cover and cook on Low heat setting 4 1/2 to 5 1/2 hours or until potatoes are tender and chicken is cooked through. Remove chicken and vegetables to platter; cover and keep warm. With fine mesh sieve, strain cooking juices into medium bowl; transfer cooking juices back to slow cooker. In small bowl, add water and cornstarch; beat with whisk into cooking juices in slow cooker. Cover and cook on High heat setting 20 to 25 minutes or until slightly thickened and bubbly around edges. With whisk, beat in butter, remaining 1 tablespoon honey and the soy sauce. Serve sauce with chicken and vegetables. Garnish with parsley. Serve with a side of green vegetables to round out the meal. Feel free to adjust the amount of honey and soy sauce to your liking, by stirring in additional teaspoons before serving.